The emergence of smart home devices, such as the Google Home, that are driven by artificial intelligence (AI) and machine learning are poised to create a 1.5% growth in industry revenue in the United States this year. Google Home: The Google Home has a knack for blending into any décor. Shorter and rounder than the Echo, it offers “swappable” base colors and textures including copper, carbon, mango, snow, marine, violet, and slate. Audio quality is better than the Echo when using hands-free calling, and Home recognizes up to six voices, with the ability to swiftly switch between multi-user preferences. Information is easily accessible as it is driven by Google’s vast information platform, allowing Home to do a solid job of intuitively following a conversation string. Amazon Echo: Equally unassuming in its appearance, but with fewer options, the Amazon Echo is a cylindrical tube that stands 9.25 inches tall and measures 3.27 inches around. It comes in black and white, answers to “Alexa,” and supports Amazon Music. Volume can be turned up slightly louder than the Home without distortion. Echo is great for shopping as it easily takes you to the seemingly endless Amazon inventory, and slightly edges out Home in third-party skills. 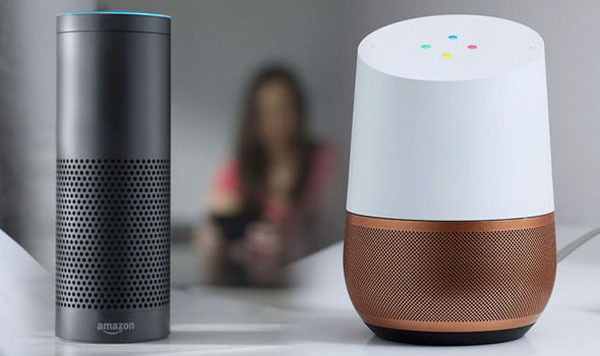 Both have voice activation features to control searches, music, and support smart home devices. Each can serve as a Bluetooth speaker, and support Pandora, Spotify, and iHeartRadio in addition to their private label channels. They connect with equal ease to most home Wi-Fi networks, and can also perform basic assistant tasks such as spelling, setting timers, and reading the news. Smart home integration is more than just a buzzword, as it has become a necessity for most. While both handle it well, Google Home goes a step farther, allowing for a far more evolved Smart TV integration. This functionality edges out the competition, ultimately making it reader’s choice.